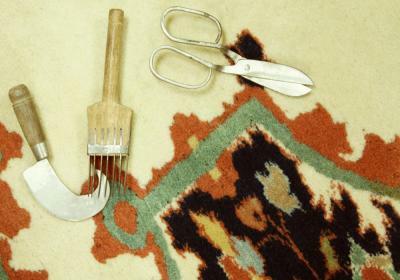 Repair of a rug falls into two basic categories: preventative maintenance(conservation) and restoration . Preventative maintenance is usually handled during the cleaning process and includes review of all edges with overcasting and binding. All service of this nature is performed by hand focusing on the structural integrity of rug. Where restoration is feasible the original weave and technique is employed. Likewise material consistency is maintained when possible to maximize the long term value and use of the rug. Hand woven rugs and tapestries of all kinds are repairable and is one of their greatest assets when compared to machine woven products. In many cases they can be restored to original or near original condition. This is even true for damaged areas that have been moth eaten, burned, dry rotted, animal chewed or otherwise suffered from major trauma. The degree of restoration or repair is directly related to the skill of the repairer and the value vs cost analysis. We welcome your other questions regarding rug services . Visit our Contact page or call (864) 895 -6544 and commence the repair process.